The Forward to this book on Natural Processes in Textile Art (and subtitled From Rust Dyeing to Found Objects) claims it is the first to bring these increasingly popular techniques together. Whether that’s the case or not, Alice Fox’s book has the quiet authority that makes it a valuable addition to any artist’s studio library. Sadly, textile art remains a marginal area in the gallery world of visual art (my local ‘world-class gallery’ has not a single textile item in its collection), even though so much of contemporary fashion and interiors depends on the highest quality and imagination of the textile artist. Where textile art from natural processes usually finds a pigeonhole is in mixed media. I feel Alice Fox’s work is definitely not in this category. It is visual art pure and simple. And in writing this I could say it carries with the kind of purity of intent, making and aspect that begins to place it alongside some of those major league figures who have made the viewing public excited about artistic interaction and intervention with nature itself. At the moment Fox’s work is mostly small-scale, indeed intimate, but there have already been examples of where circumstance and opportunity have enabled her to demonstrate a physically larger vision. I mean no criticism in saying this is a woman’s book, for women who, sadly perhaps, will be its predominant audience and readership. Very early on in the text, in a chapter titled Balancing Act, the reader is reminded that this artist’s work is a continuum of everyday life and artistic practice. The business of managing a household and small children is seen as productive tension necessitating careful planning and the use of small parcels of time. Perhaps this is an unnecessary observation seen as peculiar to women, when in fact it is equally applicable to men who increasingly need and wish to adopt a shared responsibility to sustain family life. The disciplines and strategies Fox sensibly suggests are universally valuable and a necessary adjunct to any creative endeavour – male or female. Environmental issues, sustainability and ‘thinking slow’ are watchwords within this 128-page, lavishly illustrated text. The author is relentlessly consistent with advice, indeed instruction, on health and safety issues. Infinite slow-paced care and observation, meticulous note-taking and recording, an ever-critical eye are the stuff of the author’s own practice, and, I’m all too sure, of the artists she has invited to contribute exempla and personal statements to her book. These invited contributions from such luminaries as Jilly Edwards and Dorothy Caldwell take this book to an altogether different level from Batsford’s usual fare of the crafty book for the amateur enthusiast. This makes it, at a stroke, a book for artists, and not just of those in the textile community. Although the book physically centres round a chapter titled Rust Marks, an area of practice which the author has become nationally recognised, it would be quite wrong to think that the book revolves around this seductive medium. The effect of rusting requires a special sensibility and acceptance of the unpredictable. It is close to that ancient Chinese susceptibility to read momentarily an image from a cloudscape. And the author is wise to suggest the key challenge with such unpredictability is not just to constrain it in some way but to seek a personal stance on what the artist might produce. This Alice Fox consistently manages to do, and the beautifully photographed examples of her work stand testament. It is important to say that the rust aspect is imaginatively integrated into a plethora of other techniques and processes, many of which are delightfully surprising and described with authority. That this should be the case demonstrates the very high order of the author’s thoroughness, enterprise and imagination. Whilst it is a common strength amongst successful emergent artists to focus on that one thing and one thing only, Alice Fox shows how one thing can and does lead to another, can blend with another, can enhance and take the other forward. Twisting and twining, making string and thread, tapestry frame weaving, darning acorns (!) and quilting leaves, are all delightful and intriguing by turn. These aspects are followed variously by a chapter titled Combining Techniques including layering, printing from relief, rubbing, monotypes and embossing. 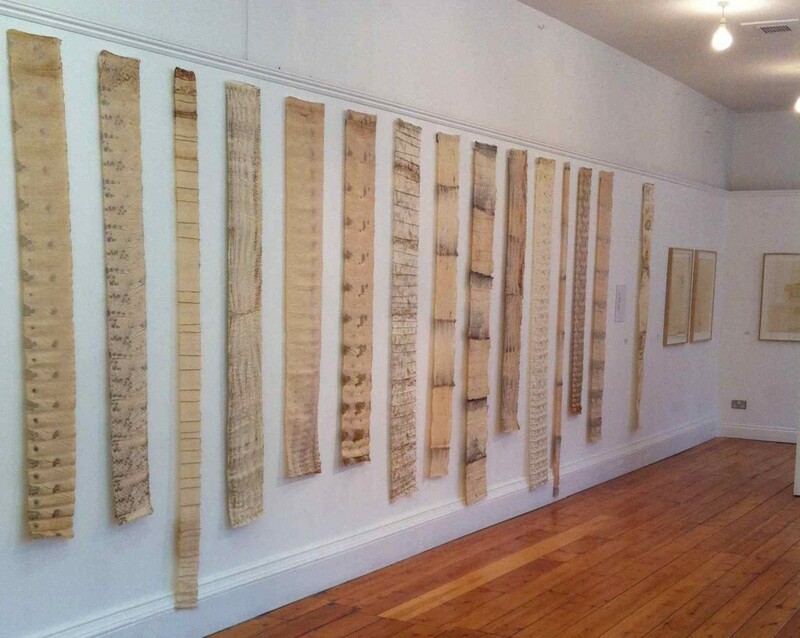 There follows screen-printing, using wax layers and a fascinating section called Textural Beginnings (i.e. preparing your material through creative structuring prior to dyeing or mark making), finally ending with book-making and the wherewithal to make an improvised printing press. For me, the section here in Combined Techniques on Experimental Stitch remained the most illuminating. The book moves towards its end with a chapter titled Sense of Place. A common term now to denote the personal artistic response to a location. I like the subsection that posed the question What is Landscape? This sensibly suggests such a question should look beyond natural characteristics. Reinforced by a following section A Coastal Perspective there is an account of the author’s residency on Spurn Point, working in a quote from Robert MacFarlane where he suggest collected objects ‘hold my landscapes together, without binding them too lightly.’ To conclude Alice Fox encourages Taking Time, and not for the first time an invitation to embrace the local. It’s a rich book and one that I hope will be read by artists generally. There’s much to learn here beyond the particularities of applied textile techniques. Thankfully there’s no photography of process itself (most of which is messy stuff on the stove or kitchen table). What we get are beautiful and restrained photographic illustration of natural objects and the author’s work, both samples and finished pieces, surrounded by precise description. This work is of a high order and an appropriate companion to its clear, concise and well-written text. 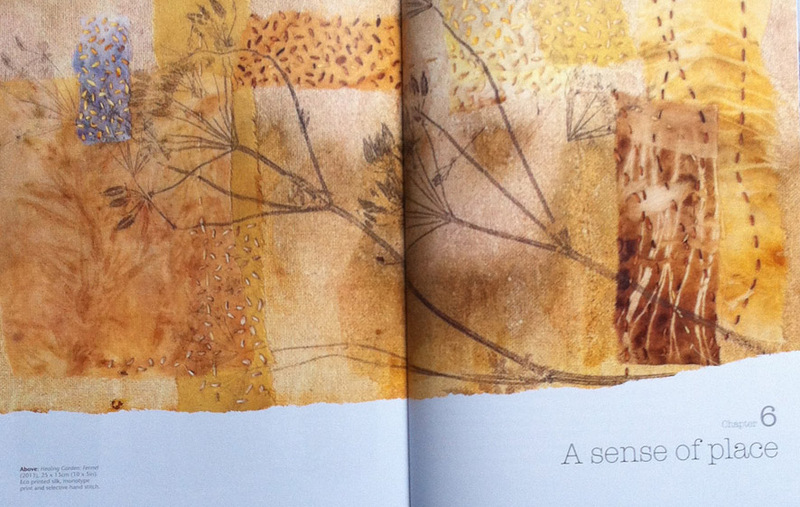 Natural Processes in Textile Art : from rust dyeing to found objects is published by Batsford. This entry was posted on August 8, 2015 at 3:24 pm and is filed under Uncategorized. You can follow any responses to this entry through the RSS 2.0 feed. You can leave a response, or trackback from your own site.